When it comes to affordable and on trend fashion jewelry, I am all about Capwell & Co. Today I’m really loving one of their latest collections – Mint To Be – and these super cute Milky Mint and Crystal Studs. For $18 it’s pretty much impossible to pass these stunning little studs up. The glass detail and minty color is perfect for spring!! There is nothing more essential to a girls jewelry collection than a staple pair of statement earrings! 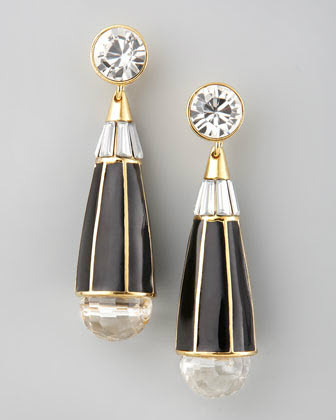 I absolutely fell in love with these Navette Burst Earrings from J.Crew. The colors are lovely and the size is really perfect for any occasion. Take them from spring to winter with the right accessories! Who doesn’t love a nice pair of studs? Even for those of you who might find Tory Burch a little gaudy, you have to admit these clover post earrings are pretty darn cute. I love the glossy black enamel on gold combo, which are just the right amount flashy and bold. While they are understated, just don’t wear them with every other piece of TB you own. Hey everyone! Jennifer here from Just Add Glam! My fellow-blogging friends at OMGBuyMeThis were sweet enough to as me to be a guest blogger and share some of my picks for what I’m wanting now. Let’s take a look! I love jewelry (earrings especially) and love the striking combination of black and gold together. It looks very old Hollywood, very glamorous, and VERY Rachel Zoe. I love the stud-like gems on these Rachel Zoe teardrop earrings for their sparkle as well as the white Swarovski crystal embellishment at the bottom of the teardrop. 14-Karat yellow gold plating outlines the art-deco teardrop shape for a dramatic look that is for sure to turn some heads! Like my pick? 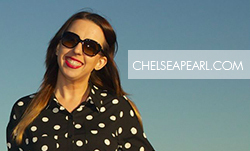 Check out my latest posts at Just Add Glam! Gimme Gimme Gimme!!! That’s literally all that comes to mind when I look at these fun TOPSHOP Drop Earrings. I love pieces of jewelry that can totally steal the show, and these are definitely show stoppers. Pair them up with a sheer white blouse, your favorite black skinnies, and some cute fall booties (like these!) and you’re in business! I knew these earrings were a hit when I pinned them and I quickly saw tons and tons of repins, so I simply had to share them on the blog as well. These studs by designer Erickson Beamom are fantastically fashion-forward with a vintage vibe. They’re large, bold and funky, coated in 24k gold and Swarovski crystals. Large chandelier earrings come and go, but I feel like studs and post earrings are always in and are much easier to wear. Whether they’re hiding out behind your hair, or the focal point with a sleeked back pony tail, these are earrings that will get some attention.